As always, George Clooney is keeping busy supporting philanthropic efforts. Last week, Clooney joined some of his celeb friends including Tom Hanks, David Letterman, Danny DeVito and Meryl Streep at the benefit " An Evening of Serious Fun: Celebrating the Legacy of Paul Newman" where he spoke affectionately about Newman’s humane accomplishments and humanitarian influence. And on Tuesday evening, Clooney was joined by his wife, activist, and human rights attorney Amal Clooney at the 100 Lives Initiative Launch in New York. 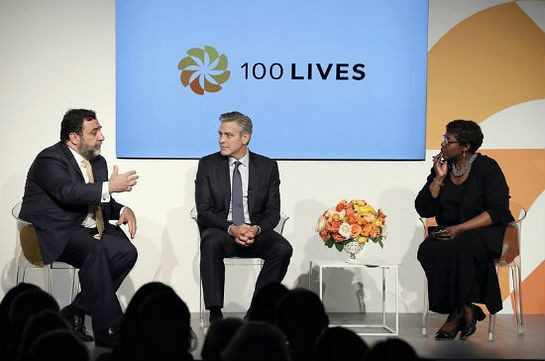 Academy Award Winner and activist George Clooney joined Ruben Vardanyan and moderator Gwen Ifill on stage to discuss the launch of the 100 Lives Initiatives, a project that will celebrate those who saved Armenians during the Armenian Genocide, and will support individuals and organizations that keep the legacy of gratitude alive (100lives.com). Clooney signs the 100 Lives pledge: "We believe that even in the darkest times, a brighter future is in the hands of those who can give help and hope." In addition to the launch of the 100 Lives Initiative, The 100 LIVES Aurora Prize for Awakening Humanity was also announced as an empowering tool for recent saviors. To learn more about the 100 Lives Initiative, visit 100lives.com.